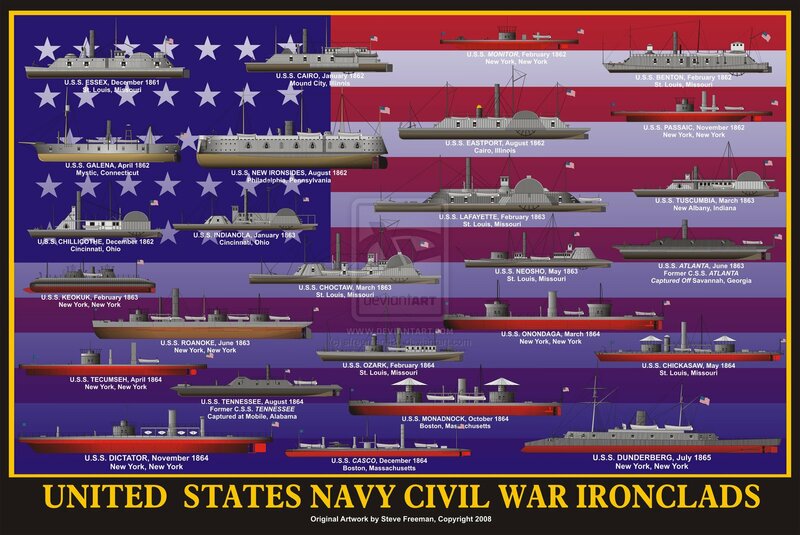 ↑United States Navy Ironclads. Original artwork and illustration: Steve Freeman. Image courtesy of Naval Analyses. 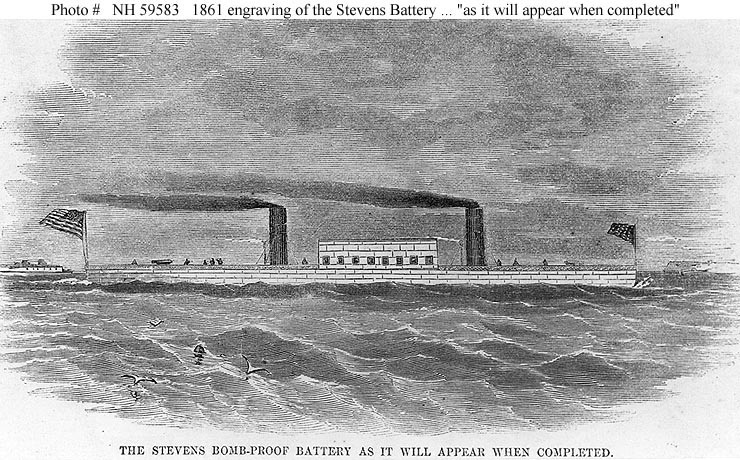 ↑"The Stevens Bomb-Proof Battery as it will appear when completed." Line engraving, published in "Harper's Weekly", in 1861. It provides a very conjectural depiction of the "Stevens Battery", which had been under construction at Hoboken, New Jersey, since 1843. U.S. Naval Historical Center Photograph. 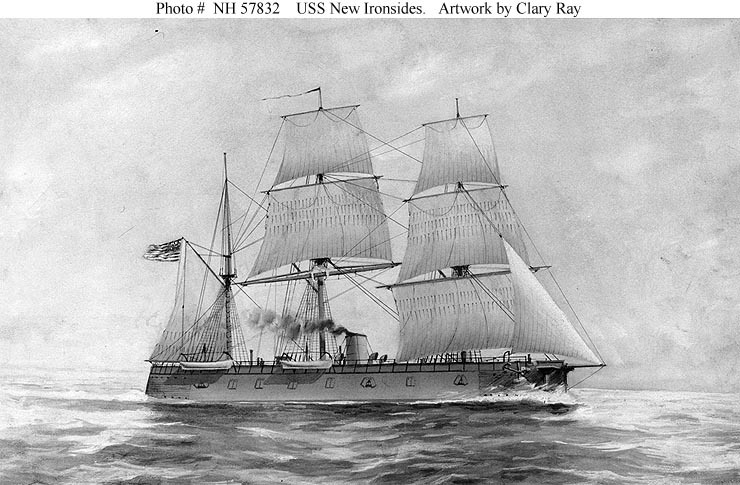 ↑USS New Ironsides. Sepia wash drawing by Clary Ray, circa 1900, depicting the ship with her full sailing rig. Courtesy of the Navy Art Collection, Washington, DC. U.S. Naval Historical Center Photograph. 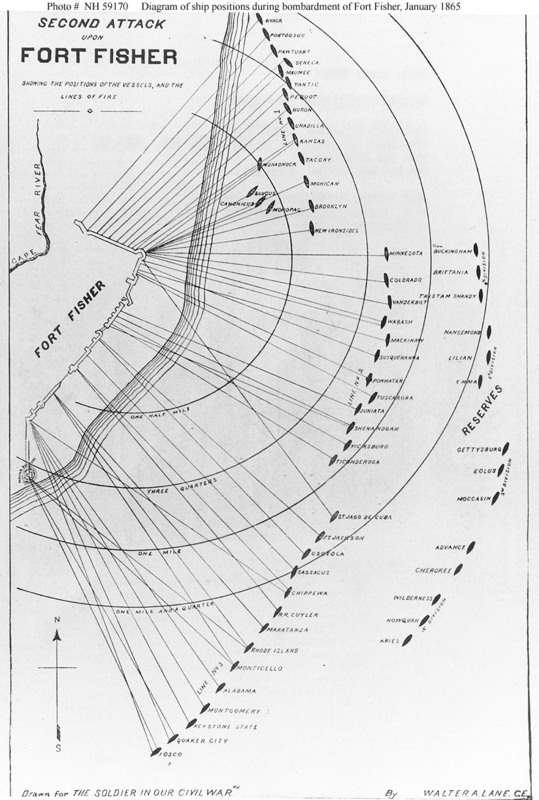 ↑"Second Attack upon Fort Fisher, showing the positions of the vessels, and the lines of fire", 13-15 January 1865. Chart by Walter A. Lane, published in "The Soldier in our Civil War", Volume II. The positions of 58 ships are represented on the chart. U.S. Naval Historical Center Photograph. 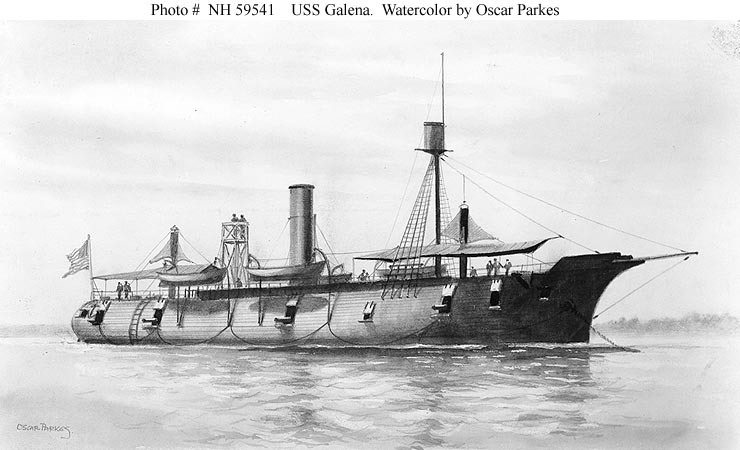 ↑USS Galena. Watercolor by Oscar Parkes, depicting the ship as she appeared in mid-1862, while serving on the James River, Virginia. Courtesy of Dr. Oscar Parkes, 1936. U.S. Naval Historical Center Photograph. 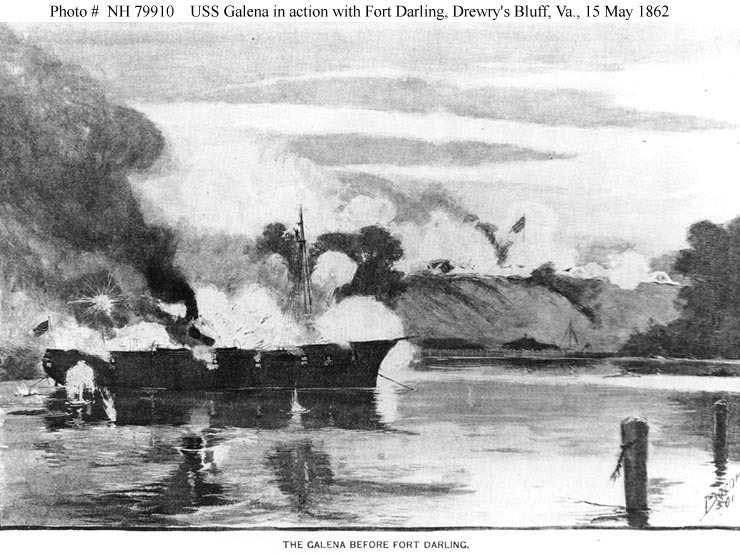 ↑USS Galena. 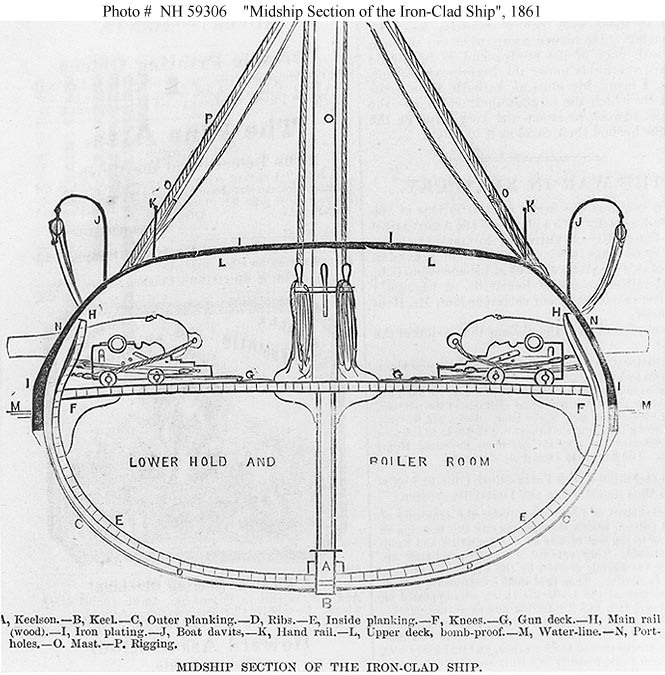 Line engraving published in "Harper's Weekly", July-December 1861, page 670, depicting the ship's hull section amidships. She was then under construction at Mystic, Connecticut. U. S. Naval Historical Center Photograph. ↑"Entrance of Rear Admiral Farragut in to Mobile Bay. 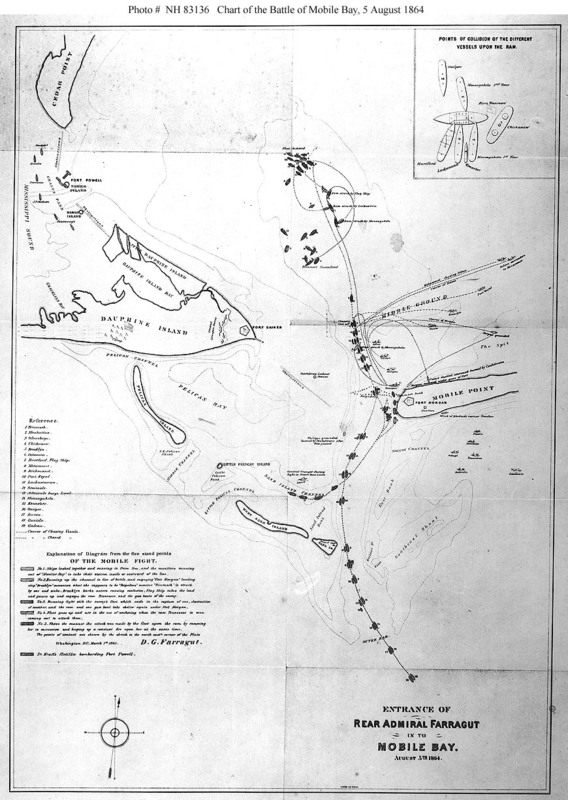 August 5th 1864" Chart of the action, prepared by RAdm. D. G. Farragut, Washington, D. C., March 1st, 1865. "Explanation of Diagram from the five stand points of the Mobile fight." (printed in the lower left): "No. 1. Ships lashed together and running in from Sea, and the monitors running out of "Monitor Bay" to take their station inside or eastward of the line." "No. 2. Running up the channel in line of battle, and engaging 'Fort Morgan' leading ship 'Brooklyn' encounters what she supposes to be 'torpedoes' monitor 'Tecumseh' is struck by one and sinks; Brooklyn backs astern causing confusion; Flag Ship takes the lead and passes up and engages the ram Tennessee and the gun boats of the enemy." "No. 3. Running fight with the enemy's fleet which ends in the capture of one, destruction of another, and the ram and one gun boat take shelter again under Fort Morgan." "No. 4. Fleet passes up and are in the act of anchoring when the ram Tennessee is seen coming out to attack them" "No. 5. Shows the manner the attack was made by the fleet upon the ram by ramming her in succession and keeping up a constant fire upon her at the same time." "The points of contact are shown by the sketch in the north east corner of the plate." "De Kraft's flotilla bombarding Fort Powell." (in upper left of the chart). Ships are (as numbered in "Reference" list at left): 1. Tecumseh; 2. Manhattan; 3. Winnebago; 4. Chickasaw; 5. Brooklyn; 6. Octorara; 7. Hartford, Flag Ship; 8. Metacomet; 9. Richmond; 10. Port Royal; 11. Lackawanna; 12. Seminole; 13. Admiral's barge Loyal; 14. Monongahela; 15. Kennebec; 16. Ossipee; 17. Itaska; 18. Oneida; 19. Galena. Courtesy of the Naval Historical Foundation. U.S. Naval Historical Center Photograph. 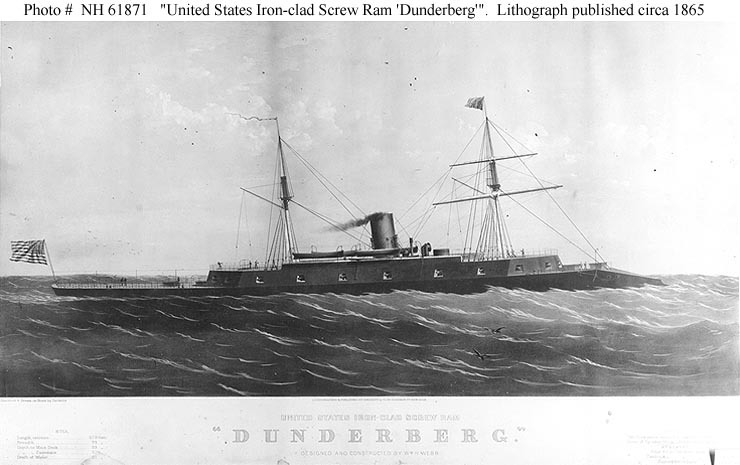 ↑Ironclad Ram Dunderberg. Lithograph published by Endicott & Company, New York, circa 1865. This ship did not enter U. S. Navy service. She was sold to France in 1867 and renamed Rochambeau. Courtesy of the Naval Historical Foundation. Gift of Rear Admiral Joseph Strauss, USN (Retired), 1935. U.S. Naval Historical Center Photograph. 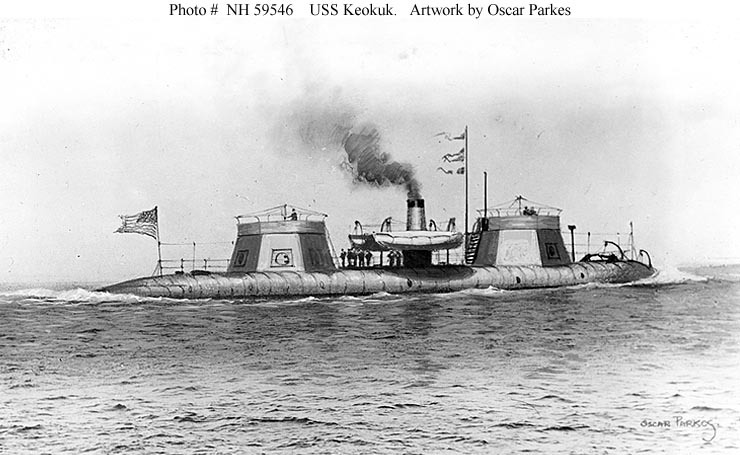 ↑USS Keokuk. Watercolor by Oscar Parkes. Courtesy of Dr. Oscar Parkes, London, England, 1936. U.S. Naval Historical Center Photograph.